This is a very unusual spiny trilobite. It is a beautiful Kolihapeltis chlupaci hollardi from Morocco. This type of trilobite is a Scutellid, but differs from most Scutellids by having five spines on the head! There are two spines that emanate from the top of each eye - one LONG spine and one short one. There is also a LONG occipital spine growing out of the center of the head. This specimen has all five spines intact, and they have all been prepared in a free-standing manner, with the three long spines flowing gracefully over the body. 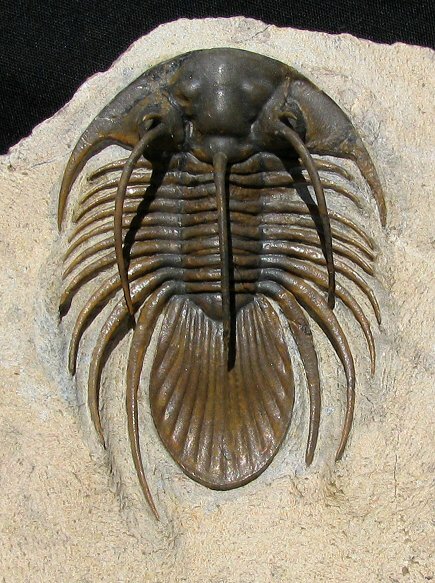 The large trilobite also has a many long body spines that are easily seen and a fabulous ribbed tail. This is a very cool Kolihapeltis, one of the most displayable ones we have had.